My anticipation mounts as the page begins to load – and then it happens. I catch a spelling mistake on the very first product description I click on, I see less-than-perfect image editing as I click through swatches, the measurements for a pair of pants seem way off – wait a minute, who has an 80-inch inseam? I sigh, put down my phone and wait until the screen lights up with my next digital offer. Fleeting are the days where people stood in lines that snaked around department stores for hours waiting for the next big deal to drop. Today, customers crave convenience. They want to buy faster and make smarter purchase decisions. They want the best deals and they want them now. This omni-channel retail study by Big Commerce and Kelton Global found that 51% of Americans prefer to shop online and 96% of Americans have made an online purchase in their lifetime (80% in the past month alone). What does this mean for retailers? They really need to step it up when it comes to product content and online presentation. There’s no room for error, and a small mistake could cost a significant sale or result in a dissatisfied customer. Should a bottle of anti-bacterial hand soap that costs a dollar get the same online treatment as the sofa that turns into a king-size bed that comes in a ton of prints with a price tag of close to eight thousand dollars? Absolutely. If both products are offered on a retailer’s website, they should ultimately have the same web presentation to ensure consistency on the site. Where the two products will differ though is in the amount of content and imagery presented. The hand soap is a volume seller, an everyday product that lots of people will buy. Specifications and images can be kept simple – a single image of what the bottle looks like, the fragrance, bottle type, and fluid ounces added into the product description and you’re done. A high-end sofa is an investment – customers will do their research, they’ll compare your site to those of your competitors, and they’ll think long and hard before deciding whether to purchase or not. It’s imperative that your e-commerce site have everything a customer needs to buy the sofa, sight unseen. The aforementioned study by Big Commerce and Kelton Global concluded that 78% of online shoppers want products to be brought to life with images, and that 78% of online shoppers want more images from e-commerce sites. Let’s go back to the eight-thousand-dollar sofa. Say your customer has their eye on the Royal Purple color scheme. They click on the swatch only to be disappointed when the couch stays its original shade of Forest Green. They then click on the lifestyle, hope restored they’ll get to see the Royal Purple sofa in all its glory. Nope – still Forest Green. Retailers often cut costs on expensive photography by only presenting the minimum online. One shot, one swatch, one angle. How can retailers get around the extremely high costs associated with product photography and have their entire catalog presented online? Simple – through digital image manipulation. A Photoshop guru can take a color swatch, repeat it, and apply it to any sofa. Seams can be blended, patterns can be changed, sofas can even be extended from love seats to three-seaters – all using imaging software like Adobe Photoshop. Outfit swap – no changing room needed! Thanks to digital imaging software like Adobe Photoshop, retailers can cut down on expensive photography costs. 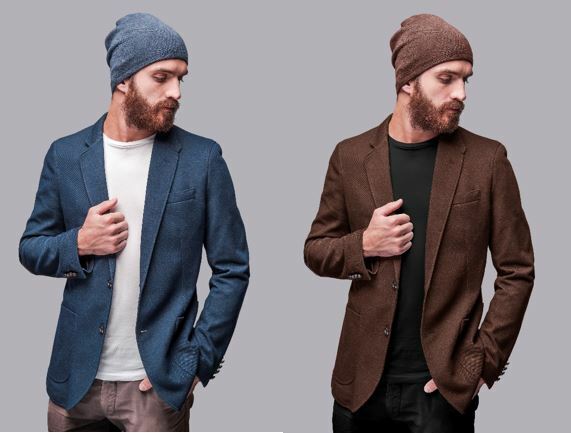 A single shot, fabric swatches, and a content specialist with advanced Photoshop skills are all that’s required to produce a plethora of digital images. And while there’s no denying that a perfectly-cropped photo is worth a thousand words (or tens of thousands of dollars in sales), the description that accompanies the product pic is equally as important. Perhaps even more significant for people (like me) who will likely pass on an article of clothing if its care instructions include dry clean only. A big reason why customers are hesitant to purchase online is because they can’t see or feel the products in real life. 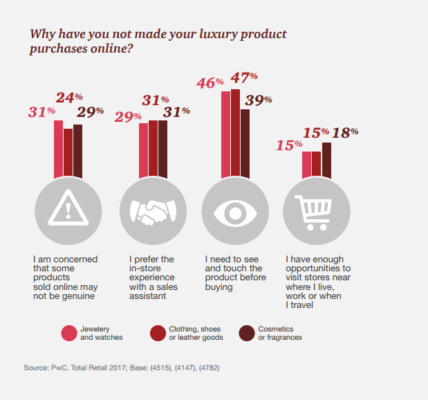 As presented in the infographic from PwC’s Total Retail 2017 Survey, 47% of respondents have not purchased clothing, shoes, or leather goods online because they need to see and touch the product before buying. A well-written product description accompanied by eye-catching imagery is exactly what shoppers need to make informed e-commerce purchase decisions. The description should not only let customers know how to use the product, but how it will fit into their everyday lives. How will it feel? How would it look in a certain area of their home? Clear, concise, and conversational writing with an injection of brand voice is the key to a solid and sales-worthy product description. Don’t leave anything to the imagination. S-P-E-L-L everything out. For example, if a child’s toy takes 4-AAA batteries and they’re not included, tell your customer because there’s nothing worse than having an extremely disappointed child on their 3rd birthday not be able to play with their big, new, shiny toy (that came pre-wrapped thanks to the site’s fabulous, add-on wrapping service) because Mom or Dad didn’t know said toy needed batteries. You’ve got your images, your description is complete, your content is loaded, and your latest and greatest product offering is ready to hit your e-commerce site. You’ve got tons of inventory and you’re anticipating big sales. You do one last scan of the product page and you see it. An extra zero in the customer facing price. What was supposed to be $100.00 is now $1000.00. Once you catch your breath, you quickly delete the zero and the price goes back down to its original number. Crisis averted – this time. Having a content quality assurance (QA) checklist is an essential part of publishing products. Whether it’s as simple as running a spell check or it involves scrutinizing every single image to make sure it’s cropped correctly to 1500 x 1500 pixels, investing the time in developing QA guidelines helps ensure all product content gets online accurately. A QA checklist also aides in the elimination of inconsistencies. If there are multiple content specialists or merchandisers loading information onto your retail site, chances are they all have “their” way of doing it. Adherence to build and QA rules will result in consistent customer-facing data and uniform product pages. Collect input from your content specialists, gather their thoughts on the best way to load content, and go from there. A QA checklist should be a living document that’s housed in a spot that’s easily accessible to everyone involved in publishing content. Updates should be communicated as they happen with detailed examples on what changes are being made and the new processes going forward. Is resolution size accurate for all images and swatches? Are the images sequenced in the right order? Have all available swatches been sourced and sized? If using clickable swatches, does the swatch match the feature image? Are colour and patterned renders realistic and do they flow smoothly? Is the item classified properly on the site’s product hierarchy? If applicable, do translations read properly? Have all pricing levels been inputted correctly? Are all necessary documents connected to the product – warranties, spec sheets, build guides, etc.? Have all product dimensions been formatted to build rule standards? Does the product description match the product SKU? Has a final spell check been done? Are all products set to publish in the content management system? We’ll revisit the $8,000 sofa one last time. Before, the site showed only one color. Now, a digital imaging expert has taken ten different fabric swatches and applied them to the original Forest Green couch. Customers can click on a swatch and see the image instantly transform to their requested colour or pattern. A copywriter has come in and spruced up the product description to include important details like seat height, care instructions, and whether the cushions can be removed. They’ve told the customers how the sofa provides cozy comfort after a long day and how it will instantly become the focal piece of furniture in any formal or family living room. The product page is now full of easy-to-read content and detailed product images. And while compelling content and amazing imagery can’t guarantee a sale, it will certainly go a long way in giving your customers everything they need to make an educated online purchase. Happy shopping! Victoria Bachiu is a Project Lead and a Senior Ecommerce Copywriter at T4G Limited. From clothing and cameras to patio furniture and purses, Victoria has written it all. In her spare time, she can be found with her merry band of Girl Guides going on camping excursions, selling cookies, and having campfires.